I know that the cops in Kenya are trigger happy, but this image from today's Standard shows things might have gotten a bit out of hand. Teacher: "Johnson, is that writing on your arm? Cheating, eh? Officer!" (Johnson sprawls dead to the ground, blood mixing with ink on his scrawny 15-year-old arm). Teacher: "Let that be a lesson to the rest of you." Teacher: "Njoroge, are you passing a note? Officer!" Njoroge turns into a bloody rag. Teacher: "Hey Odinga. 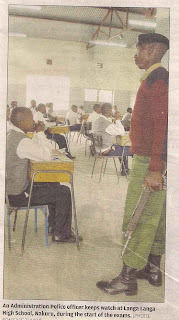 Are you writing answers on the floor with Njoroge's blood? Officer!" Could this be a solution to the breakdown in discipline in UK and US schools? I find teenagers really annoying, so I'm all for it. Officer: "Hey, are you dancing like you have a family of large and energetic spiders living in your pants, spraying teenage hormones over passers by and generally just blocking the street with your desperate, pathetic attempts to find someone who is actually foolish enough to shag you?" BLAM! BLAM! BLAM BLAM BLAM-BLAMBLAMBLAM! (Brief pause for reloading) BLAMBLAMBLAMBLAAAAAAAAAMMMMMMM! We have to be sure they are dead. *Disclaimer: I am not really advocating the mindless and brutal slaughter of teenagers who are simply finding ways of expressing themselves, as I too have had many stupid haircuts and wore things like leopardskin fringe jackets. If a psychotic killer armed with grenades, knives and automatic weapons should head down to Lake Geneva, just down from the Jet d'Eau, near the bridge and just across from the Old Town on any Saturday afternoon and let fly, I am not responsible.